Maryland celebrates its identity, and embraces its watermen, blue crabs, and the Chesapeake Bay. You see the state flag displayed everywhere. The creme of America's intelligence is concentrated in Maryland, many of them serving the nation's Capitol. Marylanders are good people, art lovers, creative designers, musicians, and frankly lots of patriots. There are not too many places as inspiring as Maryland. From the Chesapeake Bay to the mountains of Hagarstown, its beautiful all over. Every season presents a different aspect and colorful array of landscapes. 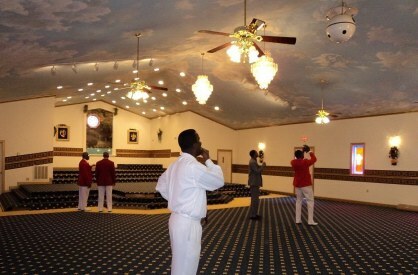 Members of the congregation admiring and taking pictures of the ceiling Mural. Ceiling Mural at the Cathedral of Deliverance in Fruitland, MD. Artist Jesse Demolli is proud to announce that he was hired to paint a ceiling mural at the Cathedral of Deliverence in Fruitland, Maryland. The Ceiling will include clouds, Doves and the face of Jesus in form of clouds. 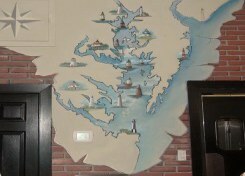 Mural at C - Street Saloon in St. Michaels, MD. Exterior Murals at Lowes Wharf Marina Inn. Jesse Demolli to transform Lowe’s Wharf marina, inn and tavern with murals celebrating the rich history of the wharf and the Chesapeake Bay. 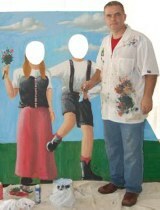 Demolli Art Studio has been hired to paint three canvas murals for Hagarstown MD Octoberfest. Waterfowl mural in Easton, MD. Demolli art believes everyone should have fine art in their home. You can own an original painting, even a custom portrait. Whether you want to create the effect of stucco or aged wall paper, we can work with you to create a magical ambiance. At Demolli Fine Art we repair the damages of the past and we protect your art from the damages of the future. Demolli Art Studio can create theatrical backdrops on site or off and install them ready for your event. Backdrop murals are lightweight and easy to install. Perfect for weddings, galas, parties, festas and feasts. Call us today to discuss creative options to make your special event unforgetable. Jesse Demolli is back in town and painting a mural at Carpenter Street Saloon in St. Michaels. Demolli's work has adorned the walls at the Rusticana restaurants in Easton and St. Michaels, the then-Yesteryears's restaurant in Easton and can be seen on the outside of what is now the ..